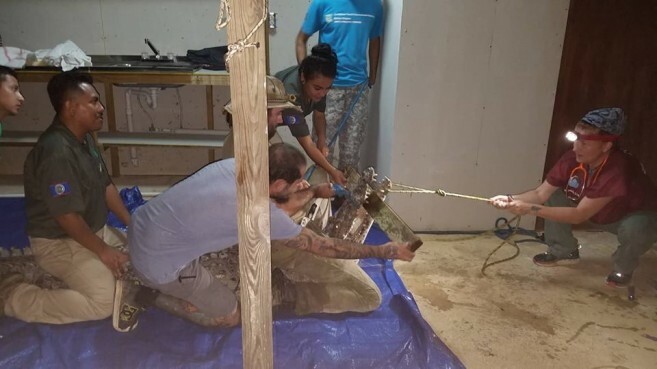 On Monday, October 8th the American Crocodile Education Sanctuary (ACES) rescued a 10-foot-long American Crocodile north of San Pedro Town named Thomas, who was found with a fishing line wrapped around his snout and leading down his throat. The crocodile was discovered by someone who was taking a photograph of him. The person noticed that something was wrong with the crocodile and called ACES for further assistance. According to ACES, they were unable to remove the line by hand, as the end seemed caught deeper inside his body where they could not reach. 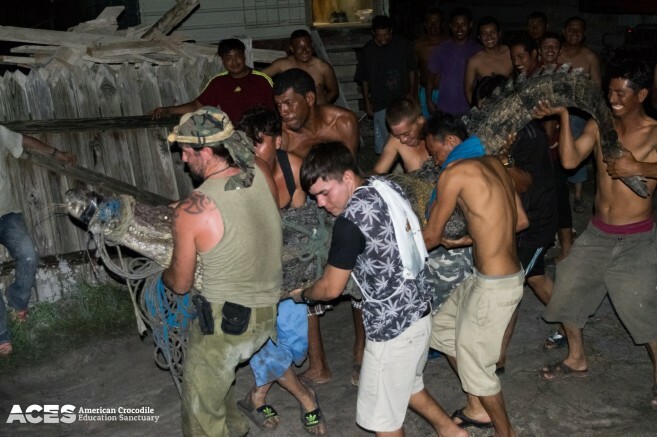 Therefore, crocodile Thomas was carried by boat to the mainland thanks to the generosity of Quality Products where the Belize Forest Department then transported him to Belize Wildlife and Referral Clinic in Unitedville, Cayo for X-rays and examination. The assessment did not show a hook in Thomas' stomach, which was great news as he will not need any risky surgery. However, they still do not know what the line is stuck on or where it ends. “He was given mineral oil in hopes that it will assist in moving along whatever is stuck. We hope he can pass the line and do so without damage to his internal organs,” said ACES. ACES reiterates that it is illegal (not to mention dangerous for all parties involved) to feed, harass, or attempt to catch a crocodile. These crimes are punishable with a fine of up to $10,000, and possible jail time. Residents are further advised to remove any tangled and broken fishing gear, so situations like this do not occur and to protect wild animals. If a crocodile in your area is causing concern, you can call ACES here on Ambergris Caye at 623-7920 or reach out to the Belize Forest Department at 822-1524. Keep in mind that only those permitted and trained in humane trapping and handling methods should come in contact with crocodiles. Apart from being illegal, catching a crocodile can be a dangerous and fatal act. To keep up with information about crocodiles and the work ACES is doing on Ambergris Caye, you can visit them on Facebook at American Crocodile Sanctuary Education (ACES).